[observations] Let's see what we see. For Serah's Gloves, they are Grey, have bands of black and chunks of Yellow, and little past the cuff. 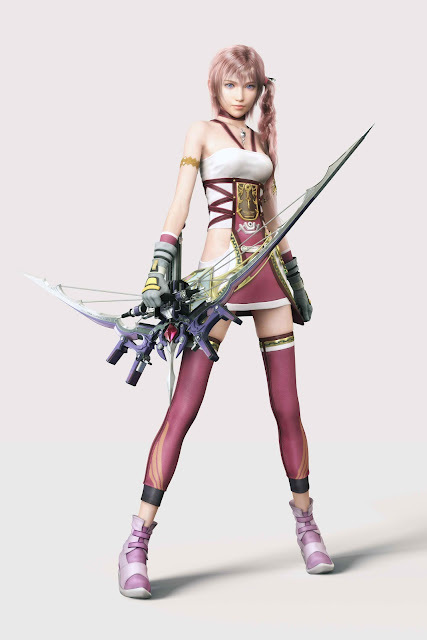 Serah also seems to be wearing a pink sleeve (same color as her dress) under her gloves. Easy to start when you get a $3 pair of Leather Gardening Gloves at the local hardware store. They aren't quite the right size for me, but $3s is cheaper and more accurate than making my own. It's cosplay, just go with it. As for the Black and Yellow pieces, I could go and get dyed leather or other fabrics, but let's make this easy. It just needs to look good in photos and not fall apart as i run around playing. Craft Foam we use! Cut out the shapes and glue them onto the leather gloves with hot glue, oh yes we will not be able to salvage this glove to it's original state (but who cares it was just $3). Ok I also made a mistake and my yellow/black pieces ended up being too large to correctly match the character's design, but I didn't realize until after I glued it to the glove. Once again, it's just cosplay, go with it. So I made cuffs, aka arm warmers, aka sleeves, using extra material from my dress. It's basically a tube that is slightly smaller than my wrist. Since it's stretchy fabric, it conforms pretty comfortably. Finished product. it's not accurate, but if people notice and judge, than they know the character a little toooooooo well. Aww I forgot, I want to also make the extra black lines by going over those existing orange lines with a sharpie.